This page created 8th December 2001, updated 12th June 2009. by Ian Smith. Best on 800*600. 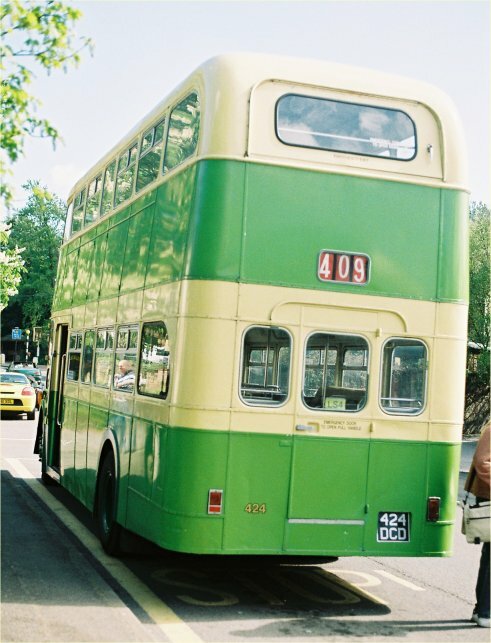 In 1975 London Country was still having rolling-stock problems, due to unreliability of its new AN Atlanteans, but could not afford to buy extra new buses. 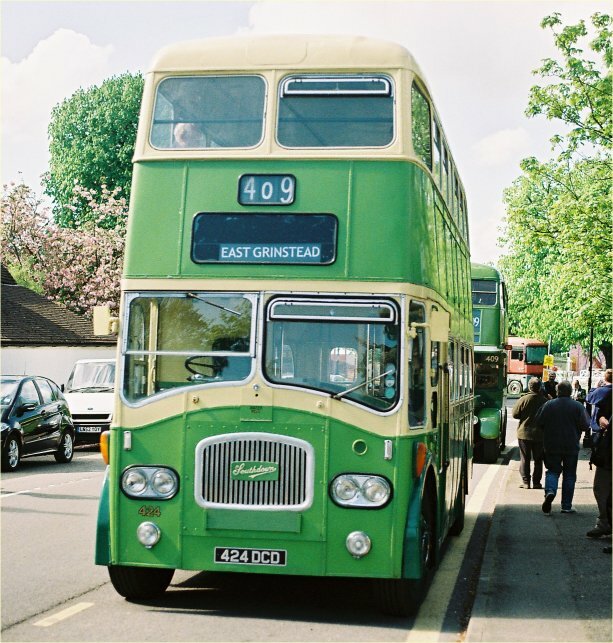 Several elderly Leyland PD3 Titans were made available by Southdown, and after a trial three were bought by London Country to operate from Godstone garage, mainly on the 409, but also on the 411. Unusually they were not repainted into London Country livery, but retained their old Southdown apple green and cream, even though they were operating into their old territory. London Country did give them fleetnames, in corporate NBC style, and classified them LS (Leyland Southdown). They trundled back and forth along the busy North Downs routes from Croydon to Forest Row and Reigate for a year and a bit until more new Atlanteans arrived to usurp them in summer 1976. Although not one of LS1-3, ex-Southdowm 424 gives a flavour of the type. 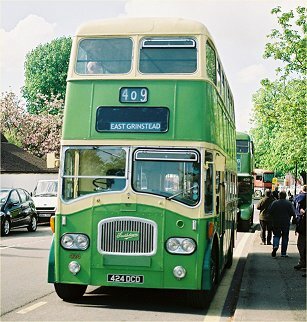 It was at Godstone Green, spending a day on the 409 during the East Grinstead Running Day. The crew put LS4 flyers inside the windows by the door. These histories are incomplete. They are based mainly on data kindly supplied to me by R.Cains. For a key to the references see the bibliography.